Last night’s ghost investigation led us to a tattoo parlor that was a family-owned funeral home, owned by three generations of one family, from 1903-2003. Gorgeous building; there was a Tiffany fireplace in the entrance in which they had a small tombstone from the early 50’s – which they’d found in the attic – on display. The staff told us a lot of stories of weird things that had happened, including several accounts of seeing a guy in a powder blue suit sitting in the doorway. “I didn’t take my eye off him, cause I know if you look away from these cats for a second, they’ll be gone!’ said the owner. Others told us pretty much the same sort of story – I questioned how sober they’d been when they say these ghosts, but it was entertaining. With us on this trip were a couple of girls who were said to be psychic – I’m always VERY skeptical of this sort of business, but, hey, I’m of the opinion that there’s no such thing as GOOD evidence of ghosts, only COOL evidence, and having a supposed psychic or two around couldn’t really hurt anything. My main job was running audio recordings, following one of the girls around. The basement was especially creepy – you can probably imagine that the basement of any given former funeral home is going to be pretty creepy. The ceiling was probably less than six feet above the ground. There were old drainage holes in the floor. Lots of weird holes in the walls. It was a few minutes later that they told us that the funeral home went out of business after the last owner died – he’d held onto it as long as he could, but his kids didn’t want to take over the family business, so it died with him. And his name was Walter. As I’ve said, I’m a confirmed skeptic. There’re ALWAYS other explanations for this sort of thing. But I had to admit – that was pretty cool. I love this job. Old Town Tatu was recently featured on Most Terrifying Places in America on the travel channel (click the link to see part 1 – the segment kicks in about 7 minutes in. Part 2 is right here. The segment features Weird Chicago’s own Ken Melvoin-Berg (as well as driver Brant McRae, who plays the “visual apparition”). The haunted tattoo parlor is also featured prominently in Your Neighborhood Gives Me the Creeps (teh excerpt online is all about the place). I was the EVP guy on the first investigation of the place a few years ago – the night when Tapeworm claimed that he’d challenged the ghosts in the place to a fight in the event of his death. “They freak me out, because everyone knows you can’t fight back with these cats!” he said (in not those exact words – I’m cleaning up his language a LOT). “So I just said, ‘listen! if I die in this place, it is ON! '” And, as the program notes, he died in the place three weeks later. I’m not sure how good the history used by Most Terrifying Places was – the history of the building is sort of in dispute. 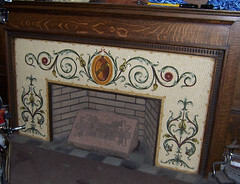 The Klemundt Funeral Parlor building dates back to the 1920s, not the 1800s, but the basement level is clearly the foundation of an earlier building, about which little is known, though it IS said to have been an 1880s funeral parlor (records on the place tend to contradict each other; a common problem around here). Even if it WAS a funeral home in those days, I’m not sure that it was the first established funeral home in Chicago, as the show says – by the 1880s, Chicago’s population was around a million, so I sort of doubt that no private funeral home had been established. However, the term “Funeral home” doesn’t appear in the Tribune until the 1890s, and “Funeral Parlor” doesn’t appear until 1902 – the custom at the time was for wakes to be held in private residences. But whether the history there is correct or not, I can vouche for the stories about Tapeworm. I have my doubts about many of the stories I’ve been told about hauntings in the place from decades past, but if there’s ever been a ghost I believed in, it’s the ghost of Tapeworm. For a LOT more information about the place, check out Your Neighborhood Gives Me the Creeps or download The Weird Chicago Podcast (16mb mp3) episode about the place, featuring recordings from the first investigation of the place, shortly before Tapeworm’s death. I understand that some of the EVP I recorded there has been analyzed for an upcoming episode of “Ghost Lab,” too. They seem to have done MUCH more historical research. Most of what they found is stuff I could have told them myself if they’d asked, but they did come up with some stuff that was news to me, including a possible identity for “Walter,” the ghost who seems to identify himself in the EVP. I’ll be back with a full report when the episode airs! 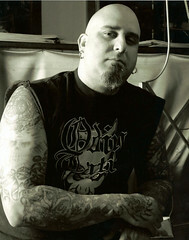 Note: In Tapeworm’s day, the place was called Odin Tatu – it was renamed Old Town Tatu after his death. For the record, it’s located on Irving Park on the Northwest side, not in the neighborhood known as Old Town. It’s too far away to be a regular stop on tours, though we have been known to go there occasionally. “Orbs” that appear to have faces in them are almost invariably just “matrixing,” a trick of the mind the makes us look for faces and other such patterns in random visual noise. 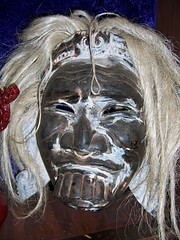 But the “face” in this one at Odin Tatu sure does look like Tapeworm! It’s one of two distinct “faces” that tend to show up in this location – the other looks like the guy on the Quaker Oats box. 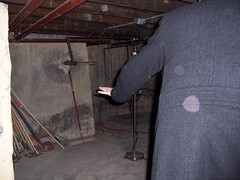 I never hold orbs up as ghost evidence, but this one is kinda neat. It was taken about a year and a half after Tapeworm’s death. This, not the mask shown in the show, was the mask Tapeworm said tended to fall off the wall. 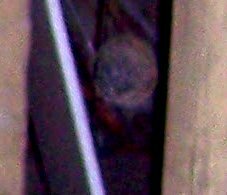 This was taken during the first investigation, just after he showed it to me.